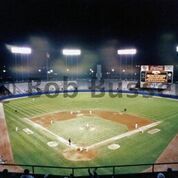 Bob Busser started taking ballpark photographs with a brownie camera at Dodger stadium in 1967. He’s visited close to 800 venues over the years and has captured a staggering 75,000 images. 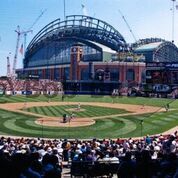 Some of the stadiums have since been demolished, such as Comiskey Park, Tiger Stadium, Candlestick Park, and Milwaukee County Stadium. 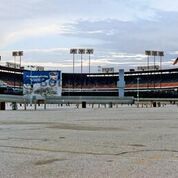 Bob chatted with me recently about how he got started photographing ballparks and shared some memories and photos of Milwaukee County Stadium. Bob listened to Vin Scully paint pictures of Connie Mack Stadium and Forbes Field in the 1960’s. His first “road trip” happened in the summer of 1976 after he graduated from high school. Bob’s mom was born in Lowell, Mass, so the family headed east. When they got to Boston, the family split up. Bob went to Fenway Park while the rest of the family went to see a Bicentennial parade featuring the Queen of England. But Fenway wasn’t the only ballpark that Bob would get to photograph on the trip. As the family traveled home, he captured Municipal Stadium in Cleveland, Tiger Stadium in Detroit, Comiskey Park in Chicago, and finally, Milwaukee County Stadium. The Brewers were out of town at the time. Once Bob started visiting stadiums, arenas, and ballparks on a regular basis, he’d talk to the front office and usually they’d just let him in. He returned to County Stadium in 1987, 1991, 1994, and 2000. 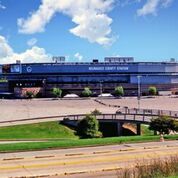 When County Stadium opened in 1953, it had just over 28,000 seats, but expansions raised the eventual capacity to 53,192. Bob says that if you look closely in his photos you can see where the add ons were. He also captured the concession stands in the bleachers which were much newer than the ones in the stadium. As fans know, not everything was perfect with older ballparks. 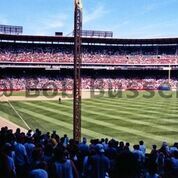 Bob pointed out that poles, obstructed views, and narrow aisles were often the norm – and this of course included County Stadium. He’s a tall guy at 6-foot-5, so getting into a seat in an older park could be a bit of a stretch. But according to Bob, County Stadium did have one of the wider concourses of the older parks he visited. Bob returned to County Stadium in August, 2000. He said the final visit was bittersweet, knowing the team needed a new park, but it meant leaving behind so much history and its own special charm. Bob mentioned so many things that Packers, Braves and Brewers fans can relate to – closing your eyes and seeing great players from the past like Warren Spahn, Hank Aaron, Eddie Matthews, Robin Yount, Gorman Thomas, and Paul Molitor. He loved the tailgating and the smell of the brats, and the taste of the ones with secret stadium sauce from the concession stand. 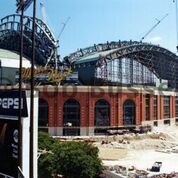 But County Stadium was well past its usefulness, and Miller Park rose in the background, ready to take over. 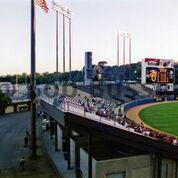 The final baseball game was played at County Stadium on September 28, 2000, and the stadium was demolished in 2001. 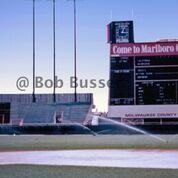 Milwaukee County Stadium lives on in our memories and in Bob’s photographs. 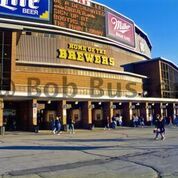 I’m happy to say that at least one of Bob’s photos will be featured in my Milwaukee Brewers historical book. Thanks, Bob! You can also read about Bob’s visits to Tiger Stadium in Detroit on the 80’s Baseball site here. There are several seats from County Stadium still in use at a rather obscure place. The baseball field for Eagan High School (suburban Minneapolis), has several of the seats set up and use-able. The park also has a full size replica of Fenway’s Green Monster in left field. The seats and the green monster were provided and build by the local volunteer booster club for the school’s team. It is certainly one of the more unique high school baseball fields around. It’s 300 miles away from the site of County Stadium. It is also just a few miles south of the site of where Minnesota’s Metropolitan Stadium (which was similar in many ways to County). But the Met was demolished in the early 80’s. Long before the acitivists at Egan were involved in the building of Eagan’s current field.